Microsoft teamed up with Coloud (a Swedish maker of audio accessories) to create and launch a new headset for Lumia smartphones. Called Hoop by Coloud, the headset is an in-ear one that's targeted at users with an active life style, being built to "handle your favorite workouts." Designed by Microsoft, the new headphones are protected against dust, splashes, and sweat, and come with a tangle-free cable that's coated with a reflective material (helping you stay visible in the dark). An adjustable support loop helps keeping the earpieces in your ear, so you won't be distracted when running. Technical specs include a 32 ohm speaker impedance, and a frequency response of 20 - 20,000 Hz. The headset weighs 20.5 grams, and can operate at temperatures between -5 and +40 degrees Celsius (23 - 104 degrees Fahrenheit). 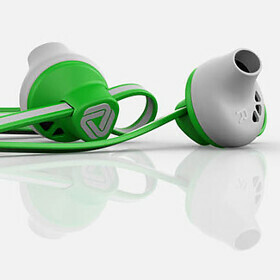 For now, the Hoop by Coloud headset seems to be available only in Europe, where it costs €29. It's offered in three color variants: green, orange, and black. Microsoft recommends us to use the Hoop by Coloud headset with the new Lumia 640 and Lumia 640 XL (but all other Lumia smartphones are compatible anyway). If you own a Lumia, would you consider buying the Hoop by Coloud as your next headphones? They look very familiar, wonder where I've seen them before. those type of earphones came out when i was 12. I don't need them, I have Sony extra base ear buds and Sony high res headphones, so I am good for audio equipment. I do like that rubber where you wrap it around. That is handy. Mine are also tangled up. Good stuff. I got those Extra bass ear buds from Sony myself. Ridiculous bang for the buck. Same quality as those $200 beats if not better. Apple Earpods/Philips ActionFit Sports Branded by JBL. That's how I'm seein it..
its funny how Apple "borrows" a design from another company (bose) and when someone else uses that style people say it is Apple that is being copied. Not only is it funny when that happens, it's hilarious how often it happens. They're interesting, but I like my Couloud Pop headphones more, though the reflective coating on these is pretty cool.